An Invaluable New Resource for Vegan Parents! Helping the world go vegan from the start, this new release will show you how to start your little ones on their vegan journey from birth. Have you ever been told that it isn't possible to raise children as vegans following plant based diets from birth? Perhaps you have come across the one story or two that claims the same isn't healthy or safe? What if I told you science and evidence based medicine is on our side, and it IS possible to raise vegan babies from birth? It's true. Major dietetic organizations across the globe have stated that plant based diets are safe and healthy at all stages of life, and that includes infancy to adulthood. 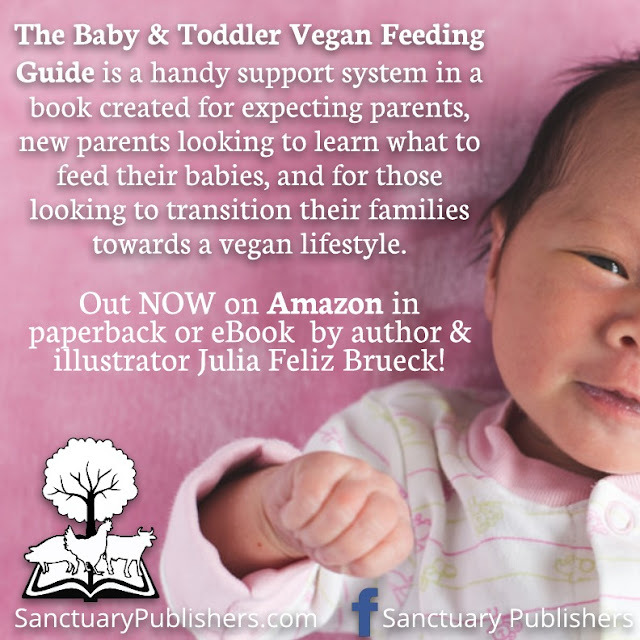 Supportive, easy to follow, and to the point, the Baby and Toddler Vegan Feeding Guide by Julia Feliz Brueck is an important resource for both parents and non-parents that want to be as informed as possible on what it means to raise children on plant based diets from the start. The guide is a handy book that helps to break down myths about raising vegan children through literature from dietetic associations and scientific literature to guide anyone raising children on plant based diets to do so simply and safely. This isn’t a typical cookbook or a book filled with complicated recipes. It is a source filled with the best possible information to raise our children in a world that hasn’t quite caught up with us yet. The guide covers the basics of the most important aspects of feeding vegan babies and toddlers – where to start, what a typical day of foods looks like, what vitamins are most important, how to deal with social situations, eating out, and much more. Published by a Sanctuary Publishers, a new vegan book publisher whose aim is to give back to marginalized communities with every book, a portion of money raised from the guide will also help support the vegan-based organization, Chilis on Wheels, which is an organization dedicated to help feed people in need with warm vegan meals. You can find the Baby and Toddler Vegan Feeding Guide on Amazon and at Vegan Essentials as paperback or eBook. And what are others saying about this guide so far?